Brick Town Talk: A Guiding Light - LEGO Town, Architecture, Building Tips, Inspiration Ideas, and more! 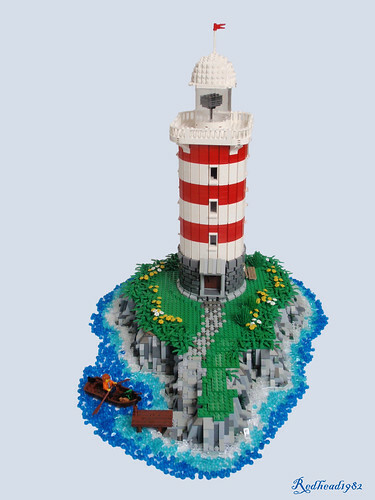 Beacon Island - (BTT) They say being a lighthouse keeper is one of the loneliest jobs in the world, but how bad can it really be? A place of your own on oceanfront property, everyday is casual Friday, and shaving is not only optional, but discouraged - sounds pretty sweet to this author. I suppose one could always get a dog for company - yet another job perk. Standing tall along the jagged shore, this lighthouse, in its traditional red and white stripes, looks just and handsome by day as it does by night. Perhaps not the most active work environment, but certainly one of the most striking.